The last time we did this was February, 2014. It's time to get new data. What we want to know is, what armor / helmet are you wearing? EDIT: If you do *not* see your armor maker listed explicitly but think it should be, that is why we are having this poll. Do chime in via reply and let us know what you are wearing. This is the single best way to ensure we have valid numbers, and that the options support it. For instance FX will be listed separately as at the start it was like 90% of the responses, now it's much lower. Once it gets below a small % then we'll just remove it as a stand-alone, e.g. usually under 5%. This poll will run for 3 weeks. It won't let me vote because I dont have FOTK and it wants me to pick one. Question, the title says OT and you also ask FOTK? Should that be added so FOTK's dont miss it? As RWA is a vetted vendor, (and very popular here in the UK (and abroad)), would it be possible at this stage to update the list? Just getting back to my build after what seems like an eternity. I added "doesn't wear a FOTK / OT TK" as an option for us who don't have both costumes. For the record I'm waiting on the Anovos FOTK. Maybe I can check that one in the poll after the next poll. Anovos FOTK is already a choice you can select. There's even two of them. Perhaps on a future poll. Right now I'd just like to see how the larger number play out. Done, though actually you're the first person to bring this up. I've never seen that armor make in person, at least here in WA state in the US. Right. I didn't read your post properly then. Yeah, not as many as other, more established makers, but more and more as time progresses. That actually makes me wonder; out of curiosity, I wonder how many EIB and Centurion awards have been achieved with different armor makers? Primary wear is Anovos for helmet and armor. I have a WTF helmet when I go as ESB (painted it to match my Anovos armor). Disappointed that DA Props aren't listed here. I have a Centurion level TK from Andy Rodgers - a highly respected armour maker that deserves a place on the list. Who's that? We can't include every small vendor out there, especially if they only serve local troopers. That's why we have the "other" selection. Andy Rodgers is a UK armour maker that ships worldwide - he's been making kits for over 15 years I believe and there's countless Tie Pilots, TDs and TKs that can vouch for him. 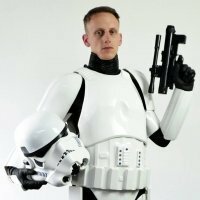 Andy Rodgers is a UK armour maker that ships worldwide - he's been making kits since for over 15 years I believe and there's countless Tie Pilots, TDs and TKs that can vouch for him. If that was really the case, I'm sure we'd known about him by now. Apparently he was on the list last year but for some reason has been missed out? There was no list last year. But it could be the case. In that case I suppose he just hasn't made enough impact on FISD to make us keep him in mind. Well then, if he's going to be known by multiple names that doesn't help at all. DA Props is also called the Shed of Glittering Delights. Yes the armor looks like it is a nice set of armor. However, remember this is not a vetting armor list. This is to collect data of what armor people are wearing. We rarely see any DA sets of TK armor show up here. And that is okay. Look I wear MTK and that doesn't get it's own line either. It's okay because not many people wear it like RS or TM or Anovos.